Mr. Saihou Drammeh, the General Manager of Gam Petroleum, yesterday told the Janneh Commission that Mr. Muhammad Bazzi owned 31.5% shares of the company. He was requested to submit documents relating to Gam Petroleum which he said are fuel storage facility that stores oil for national and international companies. He told the commission that it was the only storage facility in the country, noting that the importation of fuel was not liberalized. He testified that when he started work in 2015, they had financial audit of Gam Petroleum from 2010 to 2015 and there was no profit recorded. Mr. Drammeh said that PKL conducted the audit exercise stating that when they took over in March 2016, they made a profit of D94,000,000 from 2015 to 2016. He disclosed that from 2016 to 2017, the company made a profit of D100,000,000, adding that, form 2017 to 2018, they made a profit of D185,000, 000. Drammeh said that they had net cash flow of D85, 000,000 from 2017 to 2018 and there were lots of arrears. He pointed out that there were only two managers: the General Manager and Operations Manager at the time they took over. According to him, Euro Africa Group was in charge of Gam Petroleum Account saying that the share holders of the company are: SSHFC with 31%, GPA 14%, GNPC 10%, Ministry of Finance 3% and Fadia Mazegi with 10.5%. Mr. Drammeh further stated that, SSHFC, GPA , GNPC, Ministry of Finance and Muhammed Bazzi were members of board noting that Mr. Bazzi has two seats occupied by Lang Conteh and SSHFC also has two seats. He said that Euro Africa Group at the time were the only company importing fuel into the country, adding that from 2009 to 2014 Euro Africa Group had monopoly of importing fuel into the Gambia. He adduced that Micheal Gerad was the general manager until 2017 when he, Mr. Drammeh replaced him as the general manager. He said he did not know why Gam Petroleum was not making profit before 2015. Mr. Drammeh also told the commission that they made a saving of $25,000. 00 every month and that they had about six Lebanese some of whose services were terminated. He further testified that they used to cover housing cost of the experts and their air tickets indicating that D1.3 million per tank was being charged by Capital Gas for the supply of oil. 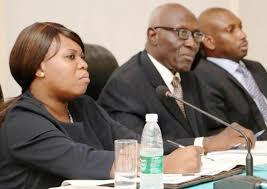 Documents relating to Gam Petroleum were tendered and admitted as evidence. Hearing continues today.